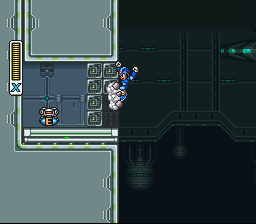 Sub Tanks are permanent items that X can acquire in four different Maverick stages. 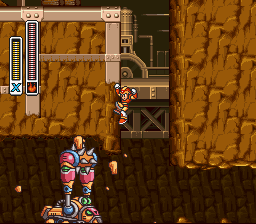 Sub Tanks can be used, at any time, to refill X's missing health. Each Sub Tank can hold up to ?? health. To use a Sub Tank, go to the Pause menu, highlight a Sub Tank, and press . It will then drain all of the Sub Tanks until X's health is full (you cannot choose to use just one at a time, they are used as a group). 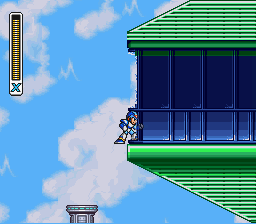 Proceed right from the start of the stage, using ladders to stay on the bottom level whenever possible. When you get to a dead end on the bottom level you will see the Sub Tank behind the wall. Use the Boomerang Cutter to grab it and the weapon will bring it back to you through the wall. 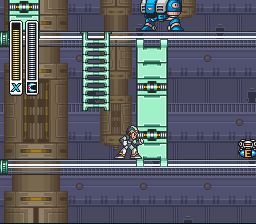 After your initial climb at the beginning of the stage, you'll find a turret sitting on a small platform. Destroy the turret and step on the platform. It will raise you up to a higher platform with a large glass window. Shoot the glass to gain access, then walk to the right and destroy the enemy you find there to shatter the rest of the glass. The Sub Tank is behind the enemy on the right. 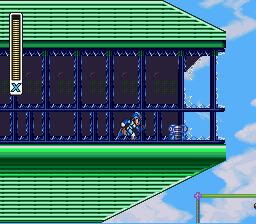 Note that you can also gain access to this building from the right side, thereby dodging the enemy in the center. Take a leap of faith for a nice surprise. In the large area with many platforms and lava on the ground (the lava will be frozen if you've beaten Chill Penguin's stage) climb up to the top platform and make your way to the left to find a 1-Up. If you dash jump from there to the left you can wall jump up the wall to see the Sub Tank behind two columns of breakable bricks. Break the bricks with your leg upgrade by wall jumping against them and the Sub Tank is yours. You can make a short cut to the Sub Tank by creating a charged Shotgun Ice platform beneath the wall leading up to the Sub Tank, bypassing the platforms with the pickaxe-throwing enemies, and the Sub Tank can also be retrieved faster with a Boomerang Cutter thrown through the wall. 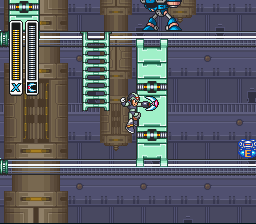 Near the start of the level you'll be required to slide down a wall and will soon be followed by a reploid swinging a spiked bar behind you. 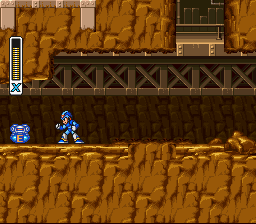 Scroll far enough down the screen to activate the reploid who will begin breaking through the wall. Wall jump back up to safety, then drop down behind it and move left into the cave to find the Sub Tank. This page was last edited on 5 November 2017, at 03:07. This page has been accessed 319,959 times.